Rub a small amount of Oi! 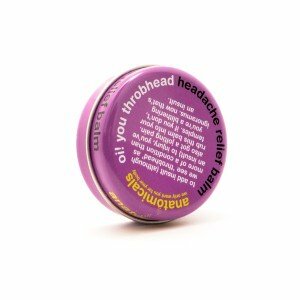 Throbhead Headache Relief Balm onto temples, forehead, back of neck, or anywhere that needs a little soothing & breathe it in. Sit back, close your eyes & relax. SKU: 60811172 Categories: Anatomicals World Of Balms, Popular, The Sleep Deprived Mama. Tags: €10 & under, €5 & under, eucalyptus, headache, headache relief balm, lavender, migraine, olive oil, Oy You Throbhead, tension headache. Do you know the feeling on one of those weeks where you have a constant banging headache from morning to night? We would like to refer to it as though there is a little elf inside your head, hammering away at your nerves and other cranial matter. You would probably be swallowing multiple pain killers every few hours, and well, since your head kept on aching, you can put it down to the headaches being those kind related to stress. You must remember always that you’re not alone! Worry not, there is a better alternative! With this magic potion of essential oils and extracts we promise to untie all the knots filling up your throbbing head. Get it now before your next headache starts to nourish! Extra Virgin Olive Oil, Golden Yellow Beeswax, Peppermint Oil, Lavender Oil, Eucalyptus Oil, Mandarin Oil, Sandalwood Oil, Rosehip Extract & Calendula Extract.